The Wyndham Championship really acts as a breather in the PGA Tour schedule; following a run of two majors and a WGC event and preceding four playoff events in five weeks it’s not surprising that most of the best players skip this event. Instead of focusing on the best, this is mainly a week for those fighting to hold their tour card and earn a spot in the FedEx Playoffs by finishing top 125. It’s a week where everyone outside on the top 125 can dream of a top five finish or win that will get them in. Going into the final round both Heath Slocum and Brad Fritsch were poised to earn enough points to move into the Playoffs and keep their cards, but neither did enough in the end and only Sang-moon Bae (who started 126th this week) moved into the Playoffs and secured his card for next season. 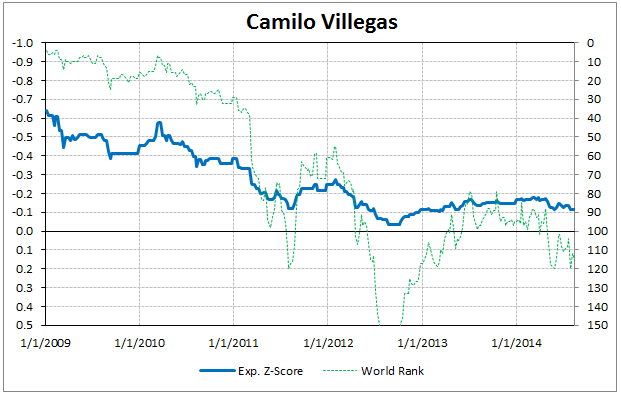 Going into the 2010 FedEx Playoffs, Camilo Villegas was 29, a three time PGA Tour winner already, and one of the thirty best golfers in the world. He had ridden a very special tee to green game to the top and looked poised to be one of the best on Tour for the next decade. His game was a mess for the next two years though; he fell as low as 160th in my rankings and 290th in the OWGR. He ranked in the top 25 of all PGA Tour players between 2003-2012 in approach shot play according to Mark Broadie’s numbers, and he was one of the more aggressive players on Tour in terms of going for the green in two. He’s lost a lot of that ability since, but his last two seasons have been more promising and he’s been steadily climbing back into the top 100 in my rankings (he’s 115th now). Now, I doubt Camilo is back. His numbers haven’t been impressive all season and there have been no flashes of brilliance (he had zero top tens entering this week). This week his game was classic Villegas – drive it well, fire at the pins, make enough birdies. In all, he gained the 2nd most shots from his driving and approach shot play in the field. He hadn’t played this well tee to green since the 2011 Barclays – almost three years ago. Tom Watson still has two more tournaments to evaluate who he’s going to fill out the US Ryder Cup squad with, but he could do a lot worse than to pick the three Americans near the top at the Wyndham. Ignoring the injured Steve Stricker and Tiger Woods, Bill Haas, Webb Simpson, and Brandt Snedeker are the 2nd, 3rd, and 4th best Americans not on the team according to my rankings (behind Keegan Bradley) and all three recorded top five finishes this week. Snedeker has been hot recently, with high finishes in the last three events fueled by quality tee to green play that he hadn’t shown all season. Simpson has scuffled a bit this year, but his game’s been a lot stronger than he’s been given credit for and he has the mystical Ryder Cup experience the captains look for. Haas has had a way better season than he’s gotten credit for – he hasn’t missed a cut since last September and he has four top tens this year – and he has experience playing in team events from the 2011 & 2013 Presidents Cup. The Wyndham is the closest he’s gotten to a win this year, but he’s been a close to a sure thing to have a solid week as anyone Watson might consider. I don’t think I’ve written anything about the Champions Tour, but Bernhard Langer is currently dominating it so thoroughly that I have to spend a little time talking about it. Langer has made sixteen Champions Tour starts this year and finished 1st/2nd/3rd eleven times, including five wins. In his only PGA Tour start at the Masters he finished 8th. In short, he’s been ridiculously good this year. He’s been four strokes better than field average, over a stroke better than any of the other senior players. My adjustment for the Champions Tour is a little rough, but generally an average PGA Tour cardholder could expect to dominate that Tour – basically playing at a level similar to Tiger, Rory, or Adam Scott over the last few years. That’s pretty consistent with the fact that the best guys on the senior Tour like Kenny Perry or Fred Couples are normally competitive, but not much better than average when they play PGA Tour golf. Adjusting Langer’s performance using that scale means he’s played roughly as well this year as the 15th best golfer in the world would be expected to (basically Keegan Bradley or Charl Schwartzel level). That’s absolutely ridiculous. Now, I’m not saying he’s actually that good or that he would be that good if he played on the PGA Tour. Champions Tour courses are set-up to fit the shorter hitting senior game and the greens/fairways are much easier to hit than PGA Tour courses. But what Langer is doing is almost unprecedented performance-wise; in the last 15 years, only 50 year old, fresh from the PGA Tour Fred Couples matched his level of performance in 2010, and he only won four times. Langer does need to add four more victories to match Hale Irwin’s nine wins in 1997.